March 28, 2010: Re-shot and reposted the Czech RAF tunic. Also, you will notice that I have been populating the site with Share this functionality to make it easier to share pages on the site. Please give credit when you do. And please become a fan of the site on Facebook. That's the destination to write comments. March 10, 2010: Have finally launched the Swiss section with a model 1940 tunic to a captain of Fliegerkompanie 12. Also included a period uniform guide and some Swiss air force photos. March 1, 2010: After a two year hiatus I am back to updating the site. I hope to have new updates regularly. December 28, 2007: Finished the series on Hungarian Air Force officer's service dress with a winter dress addition with the officer's overcoat for a major. November 29, 2007: Expanded the Great Britain RAF section with the addition of the Battle Dress uniform to Air Vice-Marshal Norman Stuart Allinson, CB and the Service Dress uniform to Group Captain Leonard Horwood, CBE, MC. November 18, 2007: Added a fantastic Soviet Naval Aviation Lieutenant Political Officer's uniform to the Soviet Navy section. November 16, 2007: Added a new addition to the Luftwaffe section with an officer pilot in a two-piece summer flight suit and a mid-war kapok flight vest. November 14, 2007: Added some more wings to the KNIL insignia section. Started a KNIL photo section with drafts of a regulations pamphlet that has some great posed photos of uniforms. I just got a hold of some new wings at the West Coast Militaria show so hoping to add them soon. Also photographed a couple of Japanese outfits and a Swiss Air Force outfit that I am working on. I also re-shot the images of the Hungarian Air Force Service Dress uniform and added the parade form of the service dress with the addition of the belt and dagger. October 26, 2007: Added some more examples of Royal Yugoslavian Flight Badges including Naval Badges. October 24, 2007: Added two more wings to the Air Force Inisignia secton of the Swedish section. Special thanks goes to Mikael Gidhagen of Sweden. Without his help and knowledge, none of the Swedish elements would have been possible. October 23, 2007: Added the Air Force Inisignia to the Swedish section. October 19, 2007: Finally got the Croatian Air Force section started with a section on Flight Badges and Rank Inisignia. October 10, 2007: Opened the Swedish Air Force section with a service dress uniform and coat to Captain Liljedahl of the F1 wing. Special thanks to Mikael Gidhagen for making this all possible. September 11, 2007: Added an interesting article on Danish aviation participation during WWII and some new photos, thanks to Morten Hein. September 5, 2007: Added a number of wonderful examples of Belgian Pilot wings for Officers and NCOs courtesy of Marc Artiges' collection. July 28, 2007: Two new uniforms today. First is a Battle Dress uniform to a Lieutenant in the RNVR FAA. Second is a really rare and unique Finnish M22 Uniform with overcoat worn with sword for parade dress. Thanks to Miikka Teräs for the great pictures from his collection. July 15, 2007: Wow. It has been a while. The collection continues unabated but the site has taken a little bit of a rest. This was not intentional. Life simply got in the way. I have re-started by re-shooting the parade dress uniform of Bulgarian Lt. Col. Aladjov with the addition of the parade dress visor hat. I have also added another country. Please enjoy the parade tunic to a Lieutenant in the Mongolian Air Force. November 12, 2006: For my good friend Doug Drabik, I have added another piece to the Soviet puzzle. I have added an M35 Major in flight outfit including his leather jacket. October 15, 2006: With the addition of the service and parade tunic for Teniente José Felipe de Pallejá Ricard I have opened up the Spanish section. I hope to add insignia soon. May 29, 2006: Courtesy of Lee Moore, I have added a Slovakian Day Observer badge. May 29, 2006: In the United States it is Memorial Day, our holiday to commemorate those who have died in military service. To commemorate, I have posted a new uniform, that of a Junior Lieutenant observer in the Dutch Naval Air Service. August 3, 2005: Added the 'pinks and greens' to a USAAF combat observer, Lt. D. Nicholson. July 28, 2005: Continuing in the Bulgarian vein, we have added the Bulgarian insignia section with lots of badges. July 2, 2005: Thanks to the efforts of Theodor Konstantinov, Bulgarian collector and historian, we have identified the Bulgarian Air Force officer who once owned the Parade tunic and Cloak. We also have his pictures. June 5, 2005: Thanks to some helpful input from Mexican historian Amando "Búho" Ramírez Navas, I have corrected and elaborated on descriptions in the Mexican section. Also, thanks to input from Patrick de Rooij, I have made corrections to the Netherlands section. May 29, 2005: Launched the new Danish section with a wing and some photos. Added an insignia section to the Netherlands with many wings. Please take a look and see if you can identify some of the specialties. April 1, 2005: Added new photos and an observer badge to the Yugoslavian section. March 26, 2005: Started a Japanese insignia section with some great badges from Jacque Pey. March 25, 2005: Opened up the Japanese section with a tropical service dress tunic to a JAAF Captain. Also added an Officer's visor cap to Estonia. March 13, 2005: Added new photographs of Bulgarian and Estonian pilots. February 28, 2005: Posted a unique summer tunic to a USCG CPO Quartermaster Pilot. February 27, 2005: Added a rare patch and photograph to the Mexican Air Force. Reshot the Greek Wing Commander of the 13th Bomber Squadron. February 23, 2005: Launched the New Zealand section with RNZAF insignia. February 21, 2005: Posted an RAAF insignia section and added a female field uniform to a Lieutenant of the VVS. February 13, 2005: Added the superior service dress uniform of Air Commodore H. F. De La Rue, CBE, DFC to the RAAF section. I was also able to add new photographs of Generals Skripko and Zhavoronkov. January 16, 2005: Continuing in the Italian section, I have added a great RSI uniform to an ANR Lieutenant of the Pioneer Branch courtesy of A. Rigutto. 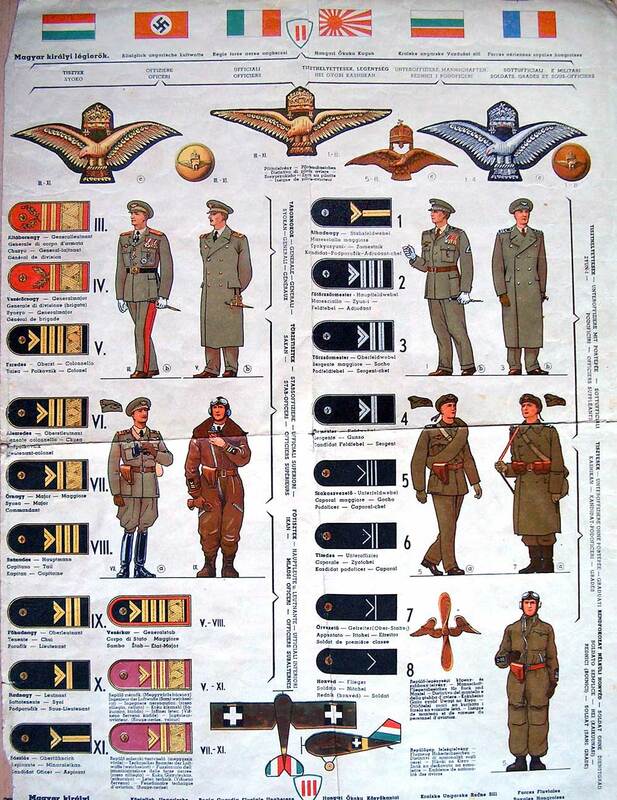 I have also added a detailed rank chart to the Italian section to help decipher all that insignia. January 9, 2005: Now available, the Italian service dress tunic of Brigadier General Pomarici. January 2, 2005: Added another rare uniform from the A. Rigutto collection - a pre-war black dress uniform of a Royal Netherlands Air Force pilot. December 28, 2004: The unique army battle dress and RAAF slouch hat of F/O W. W. Thomas, 451 squadron has been added to the RAAF. November 27, 2004: A new Australian Battle Dress uniform including the rare dark blue officer's visor hat has been added to the RAAF. November 26, 2004: Two new really rare uniforms have been provided to the museum. First is a very rare Royal Netherlands Army Artillery Lieutenant who is a qualified observer. This is courtesy of A. Rigutto's collection. The second is Miikka Teräs' fabulous Finnish M27 uniform to a Lieutenant pilot. Thanks guys. November 22, 2004: Added some new pictures and one of his combat reports to the page of Polish Battle of Britain pilot Szaposznikow. November 21, 2004: Time for some fixes. Revised the medal information on the Greek Lt. Col. Uniform thanks to new information. Revised the Estonian insignia page and added an Estonian Pilot badge in its original case as well as an Estonian cap cockade. Also added two more Russian uniforms. A VVS Major General's M40 field tunic modified for 1940 regulations and a Naval M43 service dress to a Colonel with flight gear. Also added some great photos and logbook images from Ed Chisolm, RCAF, tail gunner on R. B. Maxwell's crew. October 13, 2004: Have been adding things but not updating this page. Finally found an Italian Regia Aeronautica Sahariana uniform. Also added a really fine 1940 model Russian Naval air force uniform to a Captain Third Rank. September 12, 2004: Everyone, sorry it has taken me a while to add new items. Certainly not due to a lack of supply but a lack of time. I have been working on a redesign to the site which I hope you will find more useful and interesting. But for now, I will add more material. I have quite a few items for the USSR Naval Air Force coming. Today, I am adding the 1940 Naval Parade uniform beloning to Lt. General and commander of Naval Air Forces S. F. Zhavoronkov. Also, I have posted the 1943 model Naval Parade uniform belonging to Major General A. Z Dushin (courtesy of Doug Drabik). If anyone has any pictures of these generals, please send me a copy. I also added some more USSR flight insignia thanks to Chris Sheppard. Finally, thanks to Tristan Broos, I was able to identify the unknown Dutch East Indies badges as belonging to the Women's Volunteer Force. I added a picture for reference. July 18, 2004: Two new items today. A Petty Officer tunic from the French Aéronavale and a Spanish Civil War tunic to a Maggiore of the Aviazione Legionaria. Enjoy. July 4, 2004: Added the final uniform in the SAAF suite belonging to Lt. Col. E. A. Pope. This is his pre-WWII Mess dress tunic. June 13, 2004: Added a number of new items to the Romanian Air Force section, including two pages of photographs, two rank charts and a couple of new wings and badges in the Insignia section. June 6, 2004: Here it is, the 60th anniversary of D-Day. Let's commemorate this day with the start of the Royal Canadian Air Force section with the service dress tunic of F/O Robert Burton Maxwell, CGM, DFC. May 16, 2004: The collecting fraternity has lost one of its most knowledgeable and enthusiastic members and I have lost a friend of over 20 years. The guy who got me doing this. Paul Byron Wright passed away on Friday, May 15th, 2004. He had been suffering from a long standing spinal condition. Now he is finally at peace. Our thoughts are with Maureen, Nathan and Kelsey and the rest of the Wright family. May 16, 2004: The Royal Egytpian Air Force section is open with images of a Pilot Officer service dress tunic and an assortment of wings. May 10, 2004: Added another great tunic to Lt. Col. Pope, SAAF. His blue Patrol Tunic. May 9, 2004: Finally started the Lithuanian Air Force section with some photos and a couple of wings. If you have more material on this very small air force, please contact me. Also added another photograph of a Yugoslavian Captain. May 6, 2004: Another great Luftwaffe uniform has been added from Gene Ashton's collection, an early war Hauptmann in Fliegerbluse. April 10, 2004: Re-photographed the Italian Flight Colonel. Posted and image of a Yugoslavian Naval Observer wearing his badge. 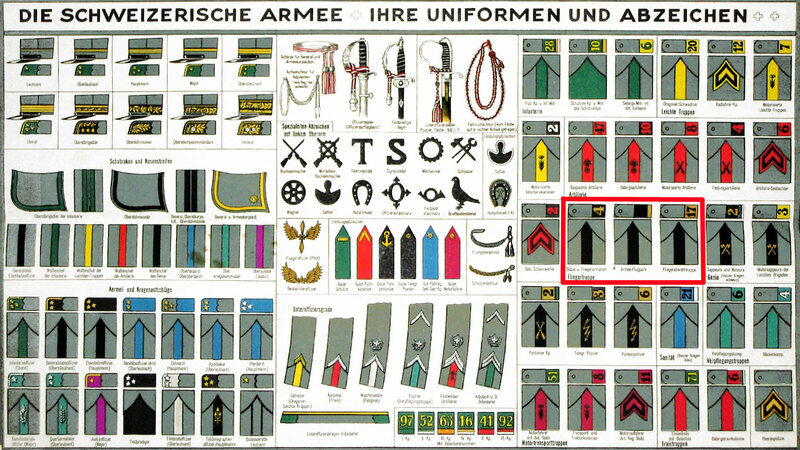 Also posted a fantastic rank chart for the Armée de l'Air custom illustrated by Pierre Gay. March 10, 2004: Added a collection of Dutch East Indies Army Air Force inisignia to Netherlands section. I have also posted what I believe to be a Belgian naval pilot wing of unknown period to Belgian section. Take a look and let me know if you can identify it. March 10, 2004: Added an M35 Field Uniform for a major in the VVS. Also added an NCO grade Belgian wing. March 10, 2004: Finally opened up a new Belgian Air Force section with a Tunic, Photos and Insignia. Special thanks to Ernesto Vitetti for his contributions. January 18, 2004: A section devoted to the insignia of the Czech Air Force has been added. Also have made new corrections to the Latvian pilot photos based on new information. January 11, 2004: Added more pictures of pilots and their uniforms to the Latvian Air Force section. A small air force that is not well documented so every image helps. January 7, 2004: Thanks to the kind submission of Lt Cdr. GPC Williams son Lawrence, there is now a picture of the Commander with his uniform. Thank you for your help. January 1, 2004: Ahh, the first post of the new year. A Maggiore of the Aeronautica Co-Belligerante in his flight suit. Please leave comments in the guestbook on the main page if you can. December 31, 2003: Here it is, the last update for 2003, the second year of this musuem. Hard to believe how much has been put in and how much more to go! I have added another superior german outfit from Gene Ashton. This time, a Major in a leather flight jacket on the western front. December 21, 2003: I wouldn't get very far with this collection if it weren't for the help of the likes of Doug Drabik, Soviet expert. Check out the banner he loaned from his collection. Also added another piece of the pre-war kit of Lt. Col E A Pope, SAAF. This time his blue patrol tunic. December 13, 2003: It has been longer than I expected for this update as I had to move the museum in the fall. Hopefully I will be able to keep a more regular schedule. New on the site is a full dress summer uniform to a Luftwaffe leutnant bomber crewman and the hat, coat and breeches to one of only two pilot generals of the Bulgarian Air Force, Lt. General Vasil Boidev. October 22, 2003: Added a very rare Estonian flight engineer insignia courtesy of Ove Tiits, collector. October 19, 2003: Finally started posting uniforms in the RAF section. Considering how many there are, it seems like a mountain. So to begin, the No. 1 Tropical Uniform to Air Commodore WJM Longmore, son of Sir Arthur Longmore. September 20, 2003: Added a Canada and Rhodesia button to main page in preparation for future exhibits. Added an extremely rare SAAF full dress uniform to then Lieutenant E.A. Pope, AFC. August 17, 2003: Opened up the US Navy section with two new items. A uniform to a Naval Air crewman Chief Petty Officer L.C. Boyd and personal items from Hellcat double ace Cdr. Hamilton "Mac" McWhorter. August 14, 2003: Re-photographed the tunic to Adjudant-chef Berteaux of the Armée de l'Air. August 8, 2003: Added Dress Whites to a Commander, CBE, DSO to the Fleet Air Arm section. July 20, 2003: Opened the Luftwaffe section with a great 1940 Feldwebel outfit from Gene Ashton, collector. July 1, 2003: Opened the Yugoslavian Air Force section. May 26, 2003: Opened the Norwegian Air Force section with Norwegian insignia. May 9, 2003: Added a Pilot Photograph section to the Bulgarian Air Force. May 6, 2003: Added an Insignia section the Soviet Air Force section. May 4, 2003: A BIG update. Most importantly, finally posted the finished section for Maj. General C.J. Venter, CB, DFC and Bar, DGAF of the SAAF. Check it out and let me know what you think in the Guestbook. Also added a great uniform poster from the Hungarian Air Force thanks to Jeno Oveges, collector. Added a new hat to the Mexican Air Force thanks to Bill Cook, collector extrodinaire. April 28, 2003: Added an Insignia section the Great Britain Fleet Air Arm section with various wings. April 26, 2003: Added an Insignia section the Finnish Air Force with pilot and radio operator badges. April 16, 2003: Added additional great pilot photographs to the Estonian and Latvian sections.. There is an PAF/RAF Officer's Cap in the Polish section. April 13, 2003: Added additional insignia to the Romanian Air Force. More full uniforms on the way. Just backlogged with the photography. March 15, 2003: Added three new country sections including Mexico, Latvia and Estonia. While there are no uniforms to show yet, there are photographs and insignia to view. If you have any information on items from these countries, have items to donate or photographs that will fill holes, please contact me with the mail button above. And please leave comments in the guestbook -- it is rather lean considering how many people come the museum each day. January 23, 2003: Added the Photographs to the Brazilian Air Force section. January 5, 2003: Added the M40 Uniform of Lt. General N.S. Skripko to the Russian Air Force Section. Added text to the description of the M40 Uniform of Lt. General P.F. Zhigarev. December 31, 2002: Added an M35 Uniform to the Russian Air Force Section. Added a Lt. Colonel of the Pioneer Branch to the Italian Air Force Section. December 27, 2002: Re-did the South African Air Force section in preparation for new items. December 15, 2002: Opened the Romanian Air Force section with Romanian Air Force insignia. Added an RNVR Sub-Lieutenant shirt white dress uniform to Great Britain Fleet Air Arm. November 9, 2002: Added Brigade Commander M35 to USSR Army Air Force. November 3, 2002: Opened new Great Britain Section with the Fleet Air Arm. The first entry is the for L/Cdr G.P.C. Williams, hero of the battle of Matapan. More to come in the near future. Also added this What's new section so it is easier to find out what I have added and what updates have been made. October 20, 2002: Added a guestbook so that visitors can add comments and corrections. Please sign in!